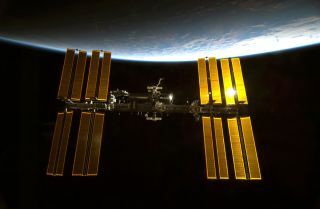 It's shaping up to be a busy spring and summer on the International Space Station, where a slew of spacecraft, both government-owned and private, are due to visit the outpost. The space agency of Japan announced Wednesday (March 21) that it would launch its third robotic cargo freighter to the station July 21. The vehicle, called the H-II Transfer Vehicle Kounotori 3 (HTV3), is due to lift off from Japan's Tanegashima Space Center, bearing food, supplies and scientific experiments to the orbiting laboratory. "The spacecraft was buttoned back up and is on track to launch on the 23rd," NASA's space station program manager Mike Suffredini said during a news conference Tuesday (March 20). In addition, a Russian robotic cargo vehicle called Progress 47 is due to launch April 20. And it's not just cargo that's traveling up to the space station. A new crew of two Russians and an American are due to lift off in a Russian Soyuz capsule from Kazakhstan on May 15. They will be replacing three current station crewmembers, half of the station's full six-person crew, who are slated to return April 30. That same day is also slated to see the first launch of the SpaceX Dragon capsule to the space station. This unmanned spacecraft is set to become the first commercial vehicle to visit the orbiting laboratory, under a NASA program aimed at stimulating the development of private craft to ferry cargo to the outpost in the wake of the space shuttle retirement. Dragon is scheduled to launch atop a SpaceX Falcon 9 rocket from Cape Canaveral Air Force Station, and dock at the station May 3. If that flight goes well, another Dragon mission could follow in August. The commercial firm Orbital Sciences is also planning to launch its robotic Cygnus capsule to the space station Sept. 1, and berth it there Sept. 6. As if that weren't busy enough, the rotating crew of six aboard the station will have their hands full with scientific research and space station maintenance, including two spacewalks (EVAs, or extravehicular activities) planned for the summer or fall. "That's a whole lot of work the crew has to do to do the berthings the dockings and the EVAs," Suffredini said. "In addition we will allocate 35 hours per week to research." Another crew exchange is also due to take place in July, with an American astronaut, a Japanese spaceflyer and a Russian cosmonaut lifting off from Kazakhstan July 15, and another crew of three due to come home in September.